Topped‎ with melted cheddar cheese, grilled onions, bacon and sour cream. Topped with swiss cheese, bacon, lean ham, lettuce, tomato and mayo. Topped with louisiana hot sauce, blue cheese crumbles. All of the Mexican specialties below include our house spanish rice served with salsa and sour cream. 12 inch - topped with pineapple and ham. 16‎ inch - topped with pineapple and ham. 12 inch - sausage, pepperoni, onions, mushrooms, green peppers, black olives. 16 inch - sausage, pepperoni, onions, mushrooms, green peppers, black olives. 12 inch - thin crust brushed with BBQ sauce, loaded with chicken and diced brisket. Topped with fried onions, cheddar and mozzarella cheese. 16 inch - thin crust brushed with BBQ sauce, loaded with chicken and diced brisket. Topped with fried onions, cheddar and mozzarella cheese. 12 inch - chicken, louisiana sauce, celery, mozzarella and blue cheese. Really spicy! Sliced chicken breast, ham, bacon cheddar and mozzarella cheese, lettuce, tomato and ranch dressing on our grilled homemade focaccia. 8 oz. Smoked beef brisket smothered in BBQ sauce, toped with cheddar cheese and sautéed onions. Served on a home made hoagie with coleslaw. All pastas are served with your choice of soup or salad and our bread-stick. Turkey, ham or roast beef, swiss cheese, lettuce, tomato and mayo. All dinners are served with choice of starch or vegetable of the day, choice of soup or salad, and fresh homemade bread. Starch choices include: baked potato, roasted garlic mashed, French fries, sweet potato fries, criss cross fries or roasted red potatoes. Smoked beef brisket smothered in BBQ mopping sauce. Served with smoked beans, coleslaw and home made roll. Fantastic Menu Selecton! Alwasy great food. Buffalo House has a large menu selection with lots of variety and they also have great specials. The food and service is always great, even when they are busy! What can I say? Been going here for years and NEVER a bad meal! Service is great, even when busy. You can choose to sit in the dining room, the bar area, or the awesome deck in the summertime. Always a good time. Good food, good variety. I had the craisin chicken salad and it was 3x more than I could eat with fresh vegetables. We had a large group with a reservation and the service was amazing!! We had pasta, my husband had Cajun while I had the chicken Alfredo. Both were wonderful, my chicken was so tender.... Our salads were large and fresh, and the homemade dinner rolls warm and huge! Definitely worth the stop! 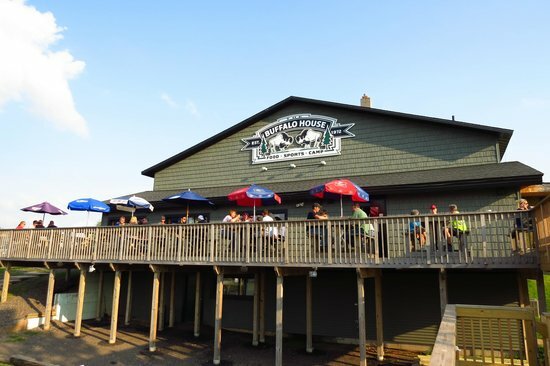 Get quick answers from Buffalo House Bar & Restaurant staff and past visitors.